In Volkswagen’s drive to become “the world’s most environmentally friendly auto manufacturer,” its climatic wind tunnel plays a significant role. This is where all new car models are tested to ensure driving safety and to improve aerodynamics, which in turn will reduce exhaust gas emissions. With a velocity of up to 200 kilometres per hour, a hurricane makes its way through a tunnel in northern Germany and strikes a car with full force. But it’s no natural hurricane, nor is it an ordinary tunnel. 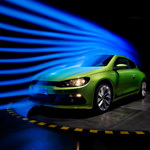 The scene takes place at Volkswagen’s climatic wind tunnel in Wolfsburg, a kind of weather chamber where all new car models are tested before they are released on the market. The wind tunnel is part of Volkswagen’s concept development, and it is the largest one in Europe – 64 metres long, 35 metres wide and 16 metres high, housed in a huge building. The enormous size is important for several reasons. Firstly, although it may seem paradoxical, it has to be large because even small joints, edges or flanges on the vehicle affect the airflow. This effect can only be tested on the original part attached to a full-size vehicle model. Secondly, units such as the engine and radiator need to be installed in the vehicle for functional testing. Finally, Volkswagen’s commercial vehicles are also developed and tested in the wind tunnel. The hurricane is generated using an enormous fan measuring nine metres in diameter, with 10 huge adjustable blades and an input power of up to 2.6 megawatts that forces air through the tunnel towards the test station where the vehicle is located. From the fan, the tunnel widens to a diameter of 14 metres. The air is guided by baffles at every turn and then flows through a 38-square-metre nozzle, which boosts its velocity to up to 200 km/h. It is one of the largest nozzles in Europe. Since the car stands on a turning platform, the wind can blow from the front and on a slope. Downstream from the outlet funnel, the air is once again guided around the corner by baffles before it is returned to the fan. At this point, the airflow has lost some of its energy, which makes it easier for the fan to generate airflow, and that in turn saves energy. In addition, the climatic parameters of the airflow can be adjusted. The temperature can be set at any value between 5 and 55 degrees Celsius. Colder temperatures are tested at a smaller wind tunnel. The humidity is completely variable, as is the intensity of solar radiation and rain in the test section. Since aerodynamics on the tops of vehicles have been tested exhaustively for decades, the biggest potential for further advancement lies underneath. Since theunderside is bumpy because of shafts, wheel arches and the exhaust system, developers work on flattening this surface by casing. Volkswagen aims to become the most environmentally friendly auto manufacturer by 2018, which means environmental protection ranks high among its corporate goals. The company aims to decrease carbon dioxide emissions both in its products and in its processes. In fact, it took many years to plan the testing facilities to meet the standards of Volkswagen’s sustainability strategy. The 11 Alfa Laval heat exchangers used for the heating circuits and closed-cycle cooling systems in the wind tunnel have clearly contributed to that goal. The heat exchangers were embedded into the circuits in 2008 and enable Volkswagen to change temperatures very quickly. “This is necessary to precisely simulate the varying conditions of crossing a pass in the mountains,” Eikmeier says. Besides using this tunnel for Volkswagen and Skoda models and Volkswagen commercial vehicles, Volkswagen also rents its climatic wind tunnel to other companies for different purposes. Companies use it to check the solidity of tents, the forces on doors of phone booths and the mounting of solar panels on roofs. To increase the available capacity and the range of climatic conditions that could be simulated, a second and much smaller climatic wind tunnel was commissioned in 1985. It measures 33 x 13 x 8 metres. This fully computer-operated unit covers a wider range of parameters and is equipped with a two-axle roller dynamometer. It simulates driving conditions on the road. Tests of the climate, heating and cooling system of the car can be conducted there. The temperature in this tunnel is adjustable from –30 to +60 degrees Celsius. Functional tests on full-size models can be carried out in the second tunnel despite its smaller flow cross section. However, aerodynamic tests on full-size vehicles and models are only possible in the large tunnel, whether they are normal winds or hurricanes. If all these tests were conducted on the road, the results would be severely affected by natural conditions that cannot be controlled, such as shifting wind direction (resulting in uncontrolled air flow), rain and fluctuating temperatures. In contrast, the simulation of driving conditions in the wind tunnel has the advantage that each test can be repeated at any time, right down to the last detail. This repeatability is key, since a vehicle needs to be continually improved during the development phase. “Reproducibility of tests is more important than achieving identical conditions in the test and on the street,” Eikmeier says.